Pitch Black or Baja Blast? Mountain Dew, with an assist from Golin, let its fans pick the classic flavor it would make a permanent part of its beverage lineup. Mountain Dew tapped its die-hard social fan base to decide which of its classic promotional flavors would become permanently available on store shelves. Pitch Black and Baja Blast were both released in 2004 and, for years, Mountain Dew has been inundated with requests from "Dew Nation" to permanently bring back the two specialty flavors. 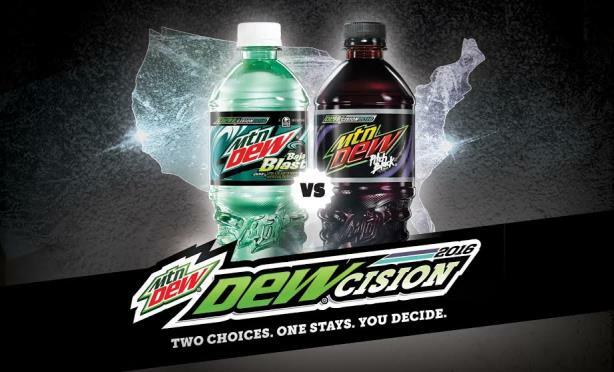 The brand decided to play on the upcoming presidential election and launch its own contest: Dewcision 2016. Leveraging its strong social presence and using interesting activations, the brand encouraged millions of fans to vote using campaign-specific hashtags. The Dew PR team, with help from agency partner Golin, developed a multi-pronged approach to formulating the promotion. "We knew that consumers needed social currency, and the content they share is a reflection of themselves, a bit of badge value, so in addition to the different voting mechanisms in place, we also added social-focused challenges that would allow them to make their votes count for a little something extra," said Ryan Collis, senior director of marketing at Mountain Dew. The campaign team wanted to use Mountain Dew-sponsored NASCAR talent to participate in the campaign and create a physical activation to resonate with the soft drink’s fan base. It targeted several media outlets, including men’s lifestyle and food and trade publications, as well as several entertainment and technology outlets. To kick off the campaign in April, the PR team partnered with the Hendrick Motor Sports racing team, which includes Kasey Kahne, Chase Elliott, and Dale Earnhardt Jr., to star in a TV commercial and debut three Dewcision paint schemes during a Sprint Cup Series race in Richmond, Virginia. The brand also extended the NASCAR component through virtual reality. 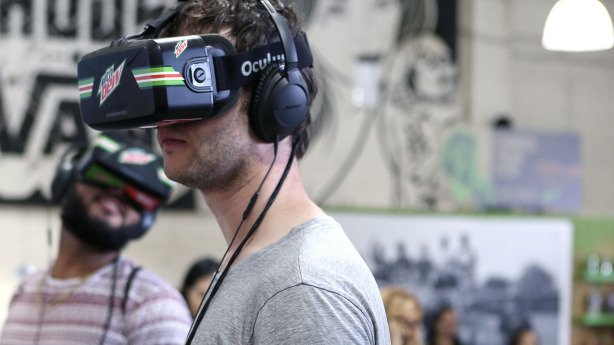 Mountain Dew and its creative partners developed a virtual reality game viewable through Oculus Rift, a racing experience loaded with Pitch Black and Baja Blast imagery. The game was available online at MountainDew.com and at the JR Motorsports Fan Day in May. The brand's active social media fan base quickly grabbed hold of the branded hashtags, which drove voting for the contest. "Specifically regarding driving to social channels...this wasn't needed as much because that's where our consumer, the Dew Nation, already lives and connects with the brand regularly," Collins added. "Our offline channels such as packaging, grassroots sampling, and events all encouraged consumers to engage with the official campaign hashtags #votepitchblack and #votebajablast." In an effort to combine Dew Nation’s desire for competition with its love of nostalgia, the brand worked with Viacom to bring to life the Aggro Crag from the 1990s Nickelodeon game show Guts. The structure was known as the Dewggro Crag, powered by The Splat. In mid-June, fans visited the Dewggro Crag in New York in the brand’s final push to generate votes for the flavors. The original host of Guts, Mike O’Malley, hosted the activation. The promotion ended on July 9 with the contest nearly tied. Nine days later, Mountain Dew announced the winner on Facebook and Twitter. Pitch Black edged out Baja Blast by less than a half of a percent of the 5.7 million votes cast. Dewcision 2016 has received coverage by Convenience Store News, Beverage Industry, The Sporting News, Digiday, NBC Sports, and Yahoo News. The campaign has generated more than 400 million media impressions, measured across both traditional and social channels.